3 Types of talks: Conference presentation Usually minutes for contributed talks. Maybe time for one or two questions. The audience is usually students, academics, and statisticians that work in industry. The talks are categorized by topic, so most of the audience will be at least somewhat familiar with your topic. Your objective is to get people interested in your work. You don t have time to present every detail of your thesis, or even a chapter from your thesis. A conference presentation is a bumper sticker. Your final presentation in this class is great practice. 4 Types of talks: Job talk Usually 50 minutes and 10 extra minutes for questions. You should impress the people in your sub-area with the depth of your contribution. You should also impress the rest of the department, who you must get to understand your problem, why it is important, and rough idea of what you did. 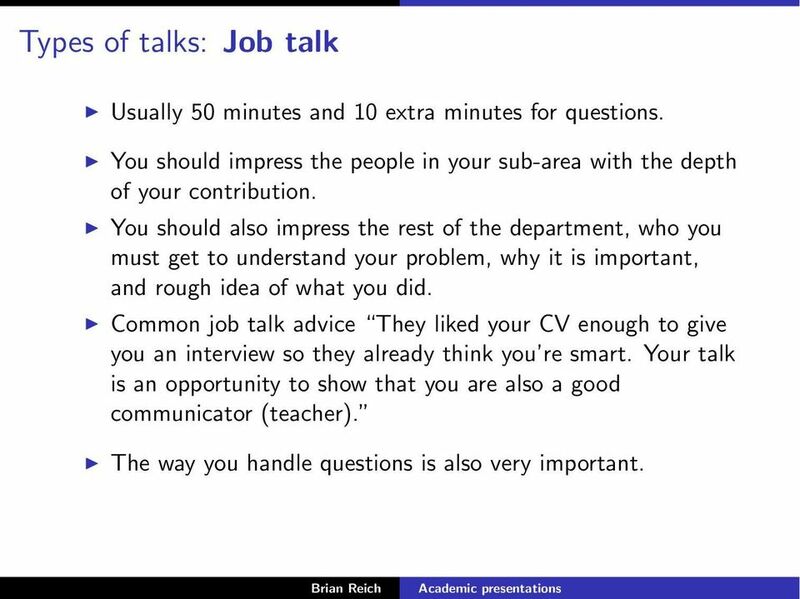 Common job talk advice They liked your CV enough to give you an interview so they already think you re smart. Your talk is an opportunity to show that you are also a good communicator (teacher). The way you handle questions is also very important. 5 Organization Similar to a good paper Golden rule: Tell em what you ll tell em, tell em, and tell em what you told em. 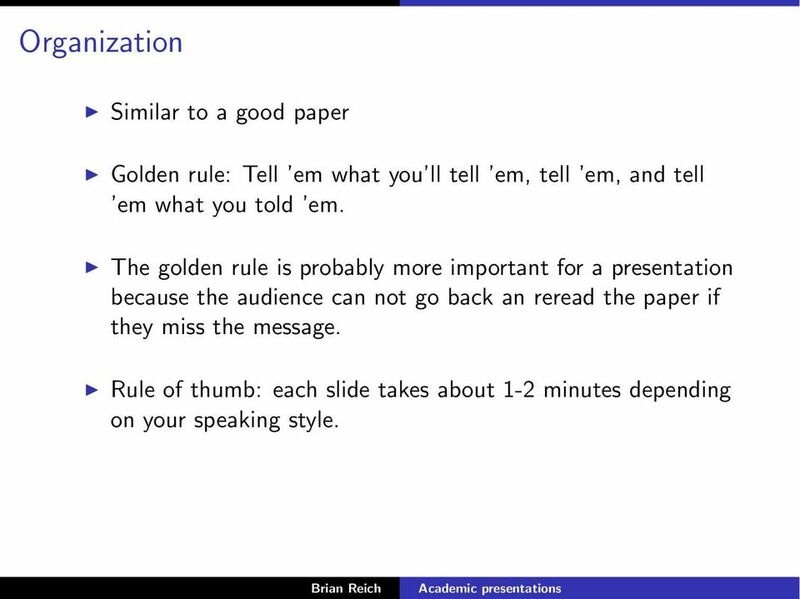 The golden rule is probably more important for a presentation because the audience can not go back an reread the paper if they miss the message. Rule of thumb: each slide takes about 1-2 minutes depending on your speaking style. 6 Outline of a conference presentation Title/author/affiliation/ address (1 slide). Motivation (2-3 slides). Similar to the first few paragraphs of the paper s introduction. For an applied talk describe the data and scientific objectives. For a theoretical talk describe the problem and limitations of current approaches. Outline (0-1 slide). Background information (1-2 slide). New Methods (4-5 slides). This is main body of the talk. Do not just present formulas, but motivate them and interpret them to give insights. 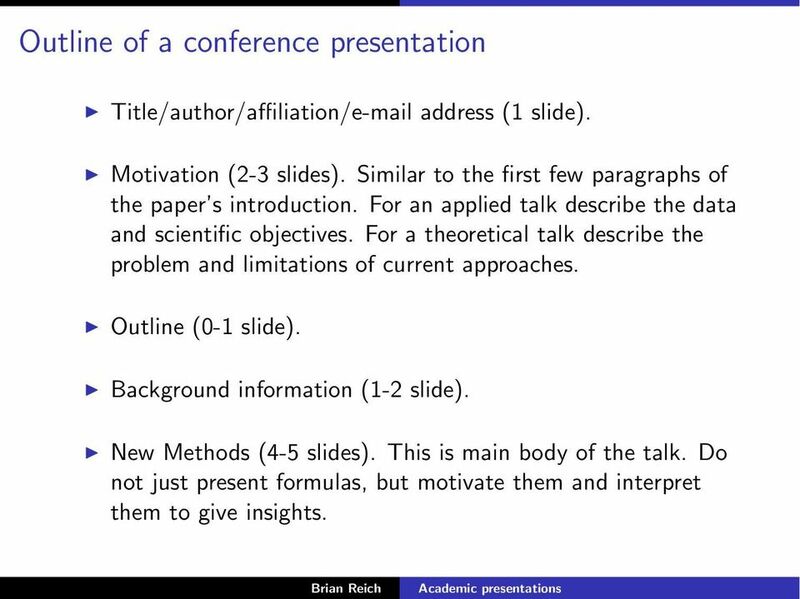 7 Outline of a conference presentation Results (3-4 slides). 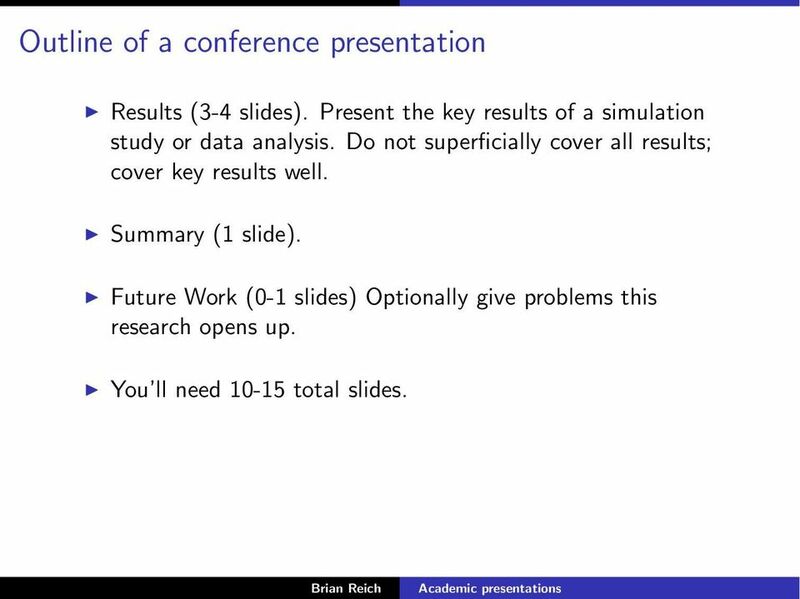 Present the key results of a simulation study or data analysis. Do not superficially cover all results; cover key results well. Summary (1 slide). Future Work (0-1 slides) Optionally give problems this research opens up. You ll need total slides. 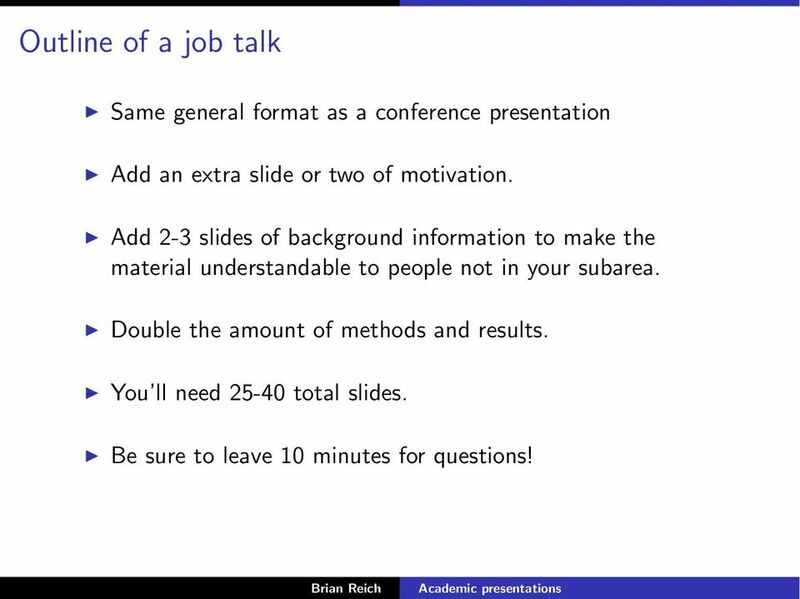 8 Outline of a job talk Same general format as a conference presentation Add an extra slide or two of motivation. Add 2-3 slides of background information to make the material understandable to people not in your subarea. Double the amount of methods and results. You ll need total slides. Be sure to leave 10 minutes for questions! 9 Preparing slides Although the organization of a paper and a presentation are similar, the presentation style should be very different. The slides for a presentation should convey ideas, not details. Attending a seminar is not a replacement for thoroughly reading the paper. You goal is a presentation is to present the material in a visually appealing way so that the main points are obvious. 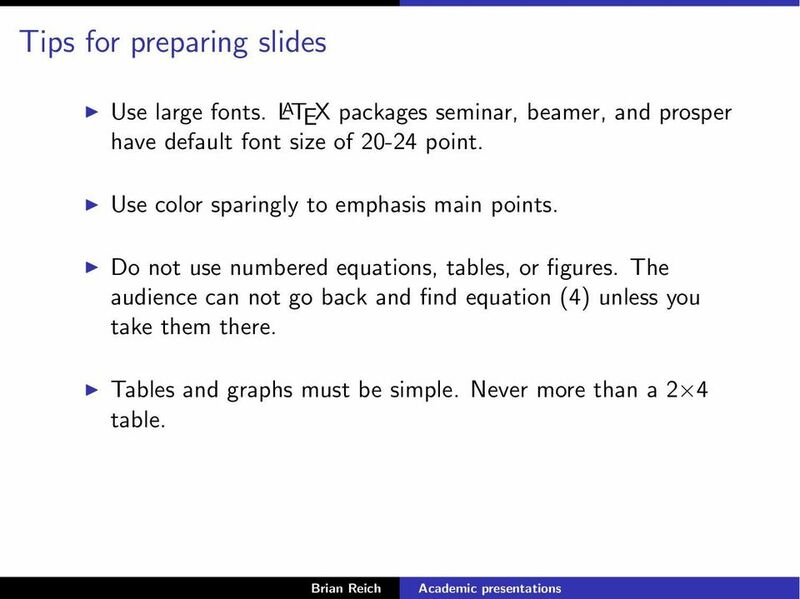 10 Tips for preparing slides Use large fonts. L A TEX packages seminar, beamer, and prosper have default font size of point. Use color sparingly to emphasis main points. Do not use numbered equations, tables, or figures. The audience can not go back and find equation (4) unless you take them there. Tables and graphs must be simple. Never more than a 2 4 table. 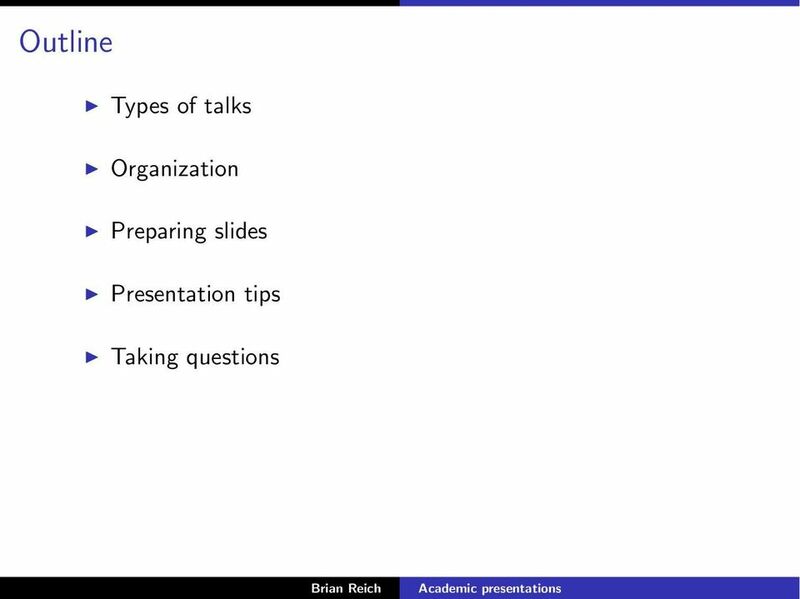 11 Tips for preparing slides Most importantly, organize slides to emphasize the big picture. Bullet points are far more effective than paragraphs. You can fill in some of the details verbally during your talk or refer to the paper for very technical material. 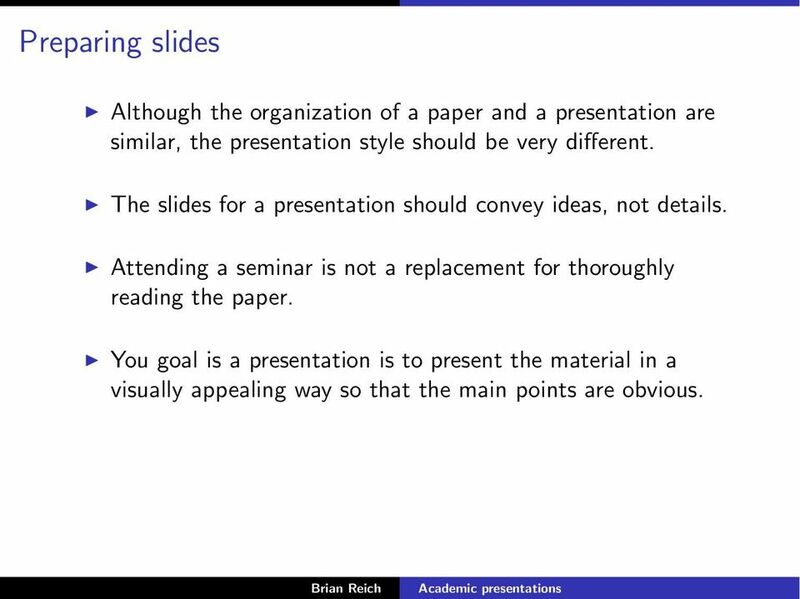 In fact, you do not need to use complete sentences in your slides. 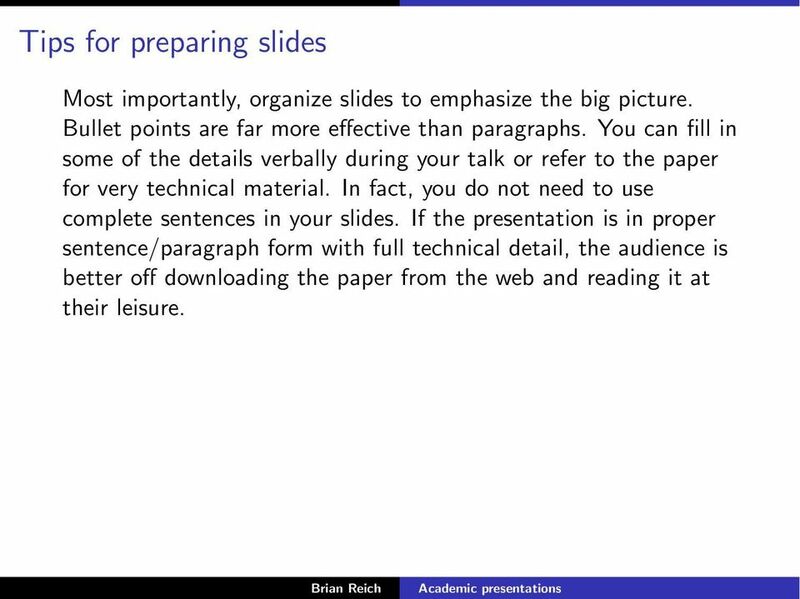 If the presentation is in proper sentence/paragraph form with full technical detail, the audience is better off downloading the paper from the web and reading it at their leisure. 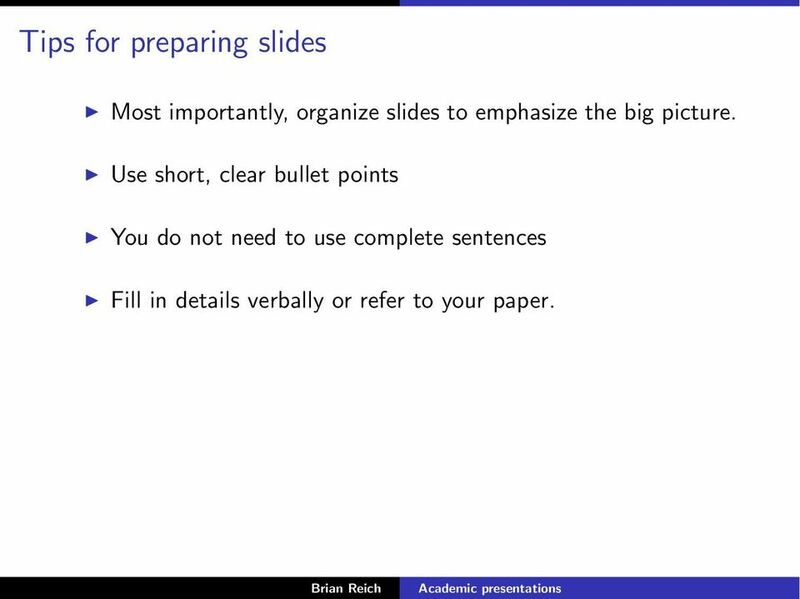 12 Tips for preparing slides Most importantly, organize slides to emphasize the big picture. Use short, clear bullet points You do not need to use complete sentences Fill in details verbally or refer to your paper. 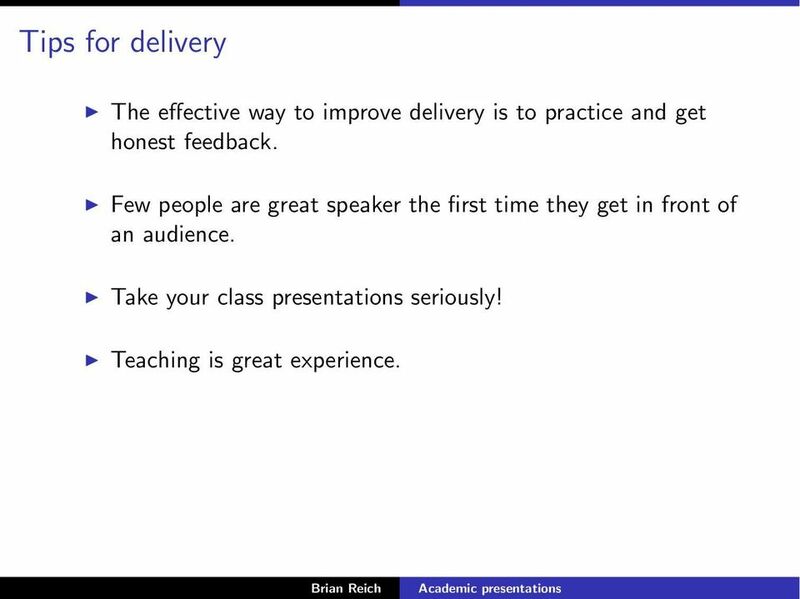 13 Tips for delivery The effective way to improve delivery is to practice and get honest feedback. Few people are great speaker the first time they get in front of an audience. Take your class presentations seriously! Teaching is great experience. 16 PRACTICE MAKES PERFECT! 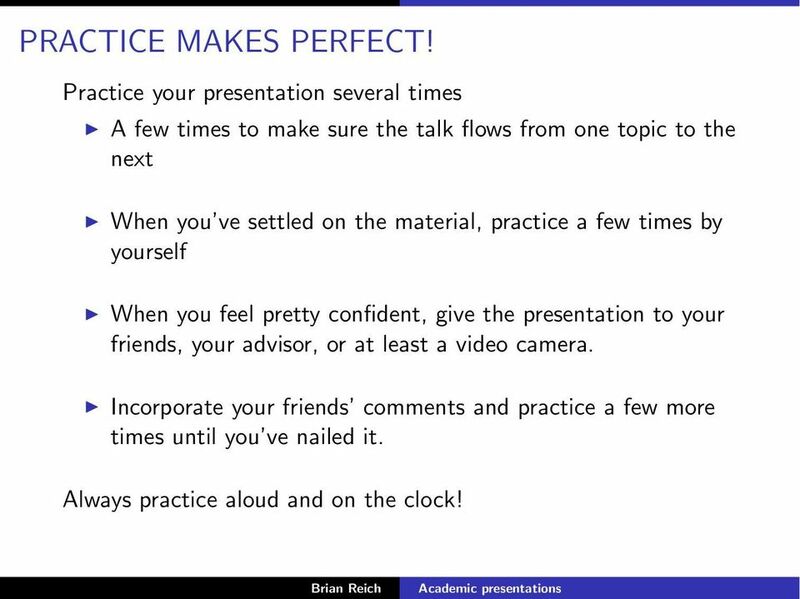 Practice your presentation several times A few times to make sure the talk flows from one topic to the next When you ve settled on the material, practice a few times by yourself When you feel pretty confident, give the presentation to your friends, your advisor, or at least a video camera. Incorporate your friends comments and practice a few more times until you ve nailed it. Always practice aloud and on the clock! 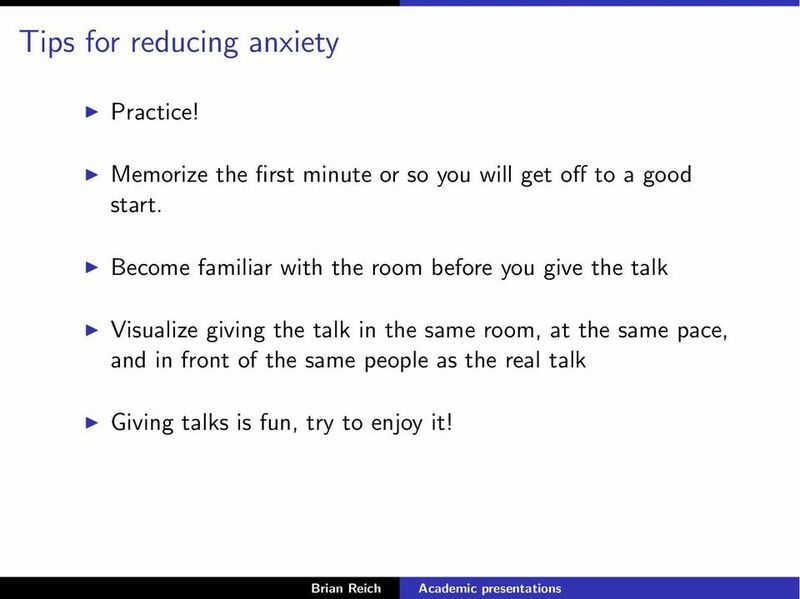 17 Tips for reducing anxiety Practice! Memorize the first minute or so you will get off to a good start. Become familiar with the room before you give the talk Visualize giving the talk in the same room, at the same pace, and in front of the same people as the real talk Giving talks is fun, try to enjoy it! 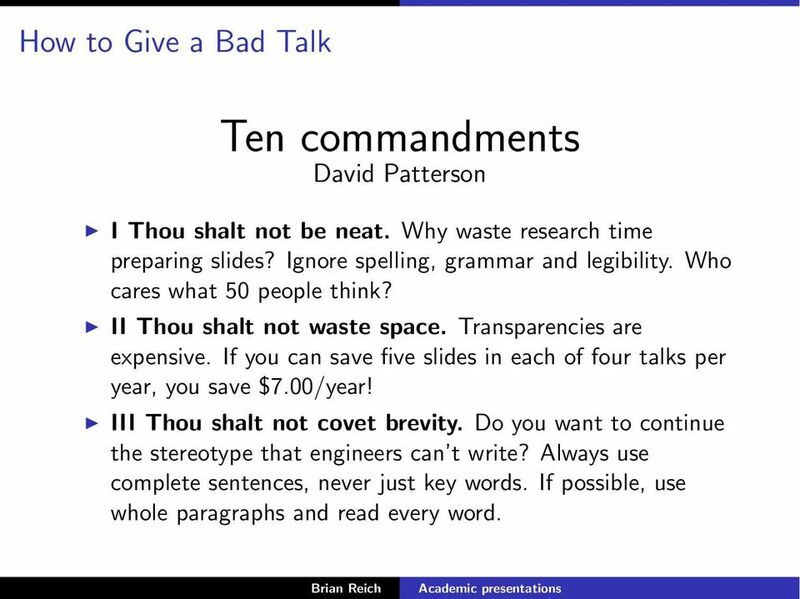 18 How to Give a Bad Talk Ten commandments David Patterson I Thou shalt not be neat. Why waste research time preparing slides? Ignore spelling, grammar and legibility. Who cares what 50 people think? II Thou shalt not waste space. Transparencies are expensive. If you can save five slides in each of four talks per year, you save $7.00/year! III Thou shalt not covet brevity. Do you want to continue the stereotype that engineers can t write? Always use complete sentences, never just key words. If possible, use whole paragraphs and read every word. 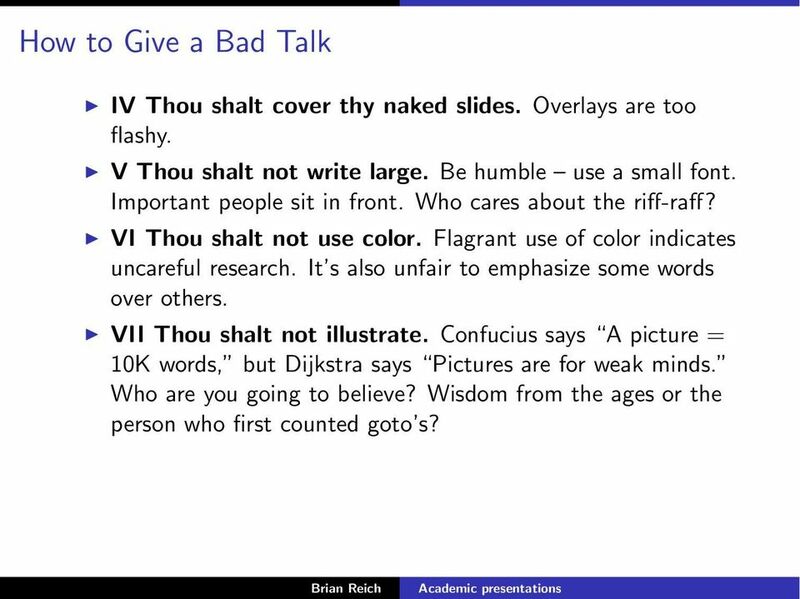 19 How to Give a Bad Talk IV Thou shalt cover thy naked slides. Overlays are too flashy. V Thou shalt not write large. Be humble use a small font. Important people sit in front. Who cares about the riff-raff? VI Thou shalt not use color. Flagrant use of color indicates uncareful research. It s also unfair to emphasize some words over others. VII Thou shalt not illustrate. Confucius says A picture = 10K words, but Dijkstra says Pictures are for weak minds. Who are you going to believe? Wisdom from the ages or the person who first counted goto s? 20 How to Give a Bad Talk VIII Thou shalt not make eye contact. You should avert eyes to show respect. Blocking screen can also add mystery. 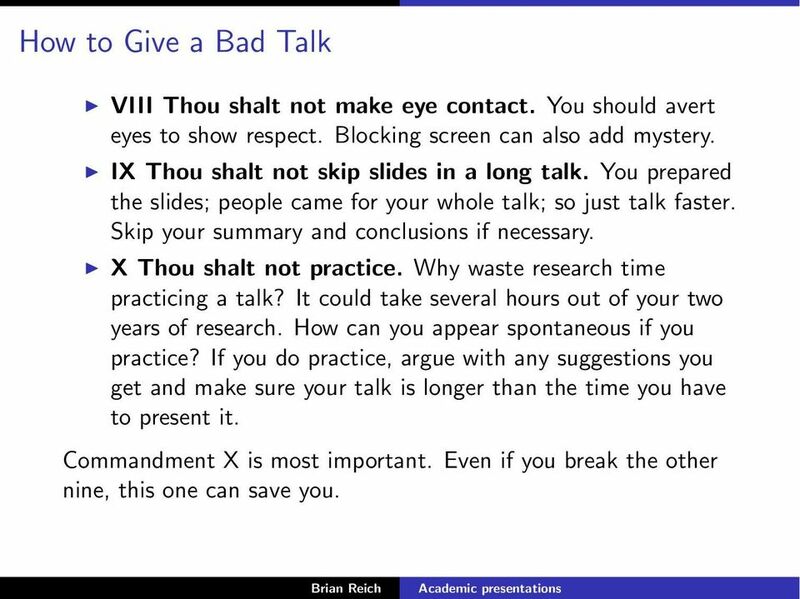 IX Thou shalt not skip slides in a long talk. 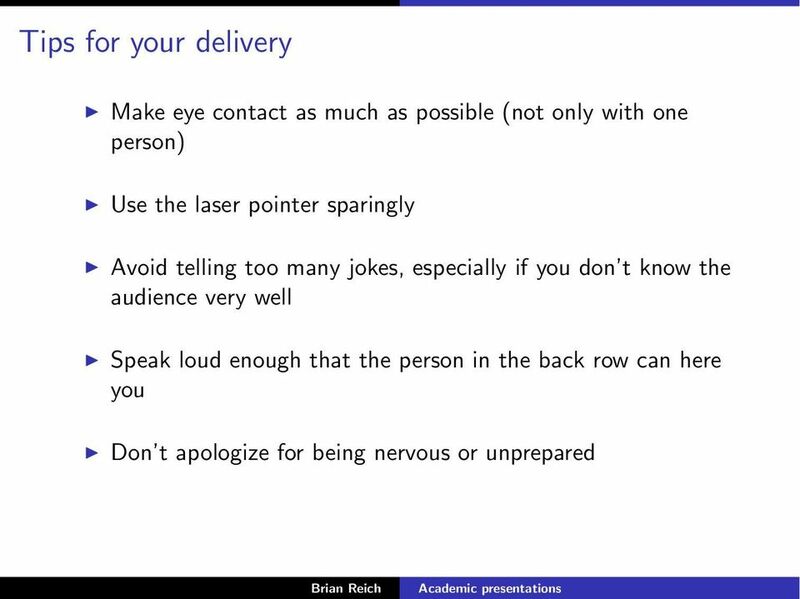 You prepared the slides; people came for your whole talk; so just talk faster. Skip your summary and conclusions if necessary. X Thou shalt not practice. 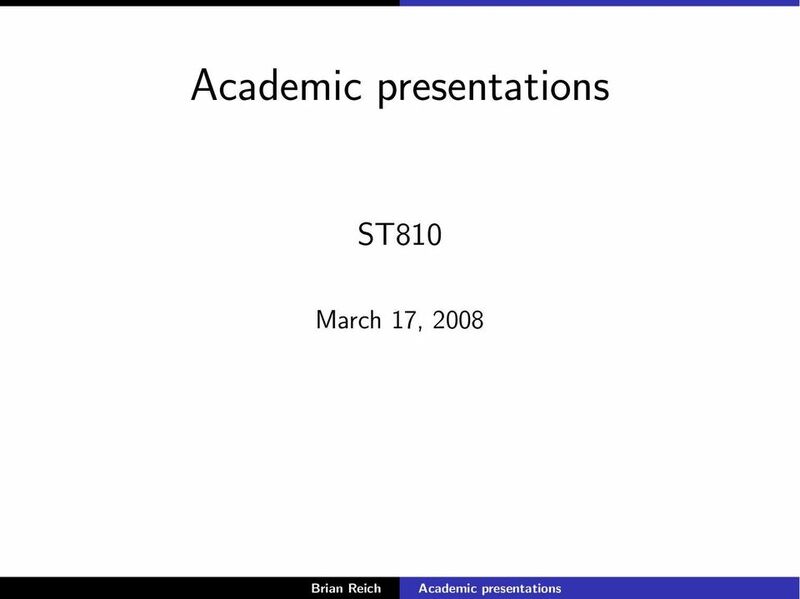 Why waste research time practicing a talk? It could take several hours out of your two years of research. How can you appear spontaneous if you practice? If you do practice, argue with any suggestions you get and make sure your talk is longer than the time you have to present it. Commandment X is most important. Even if you break the other nine, this one can save you. 21 Handling questions Always repeat each question so the entire audience knows what you ve been asked. Always be respectful! Even if the question is way off, address it the best you can and try to add something interesting to the response, even if it s more than the person was asking. Avoid long one-on-one discussions, especially arguments. This is a very interesting conversation, maybe we can discuss it further after the seminar... Finish your answer by asking the person who asked that question whether or not you answered the question sufficiently for them. 22 Handling questions If you can t answer a few of the questions, it s OK, don t apologize. That s a very good question. We hadn t thought of that before... Offer to research an answer, then get back to the questioner later. Suggest resources which would help the questioner to address the question themselves. Ask for suggestions from the audience. 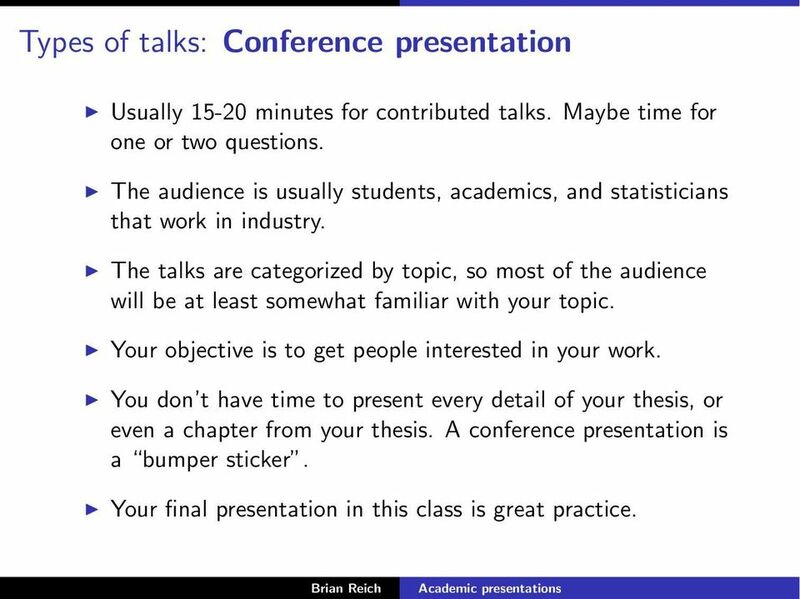 23 Conclusions Presenting your work is an important part of your research career Present ideas, not details Practice the talk many times Attend as many talks as you can in grad school! 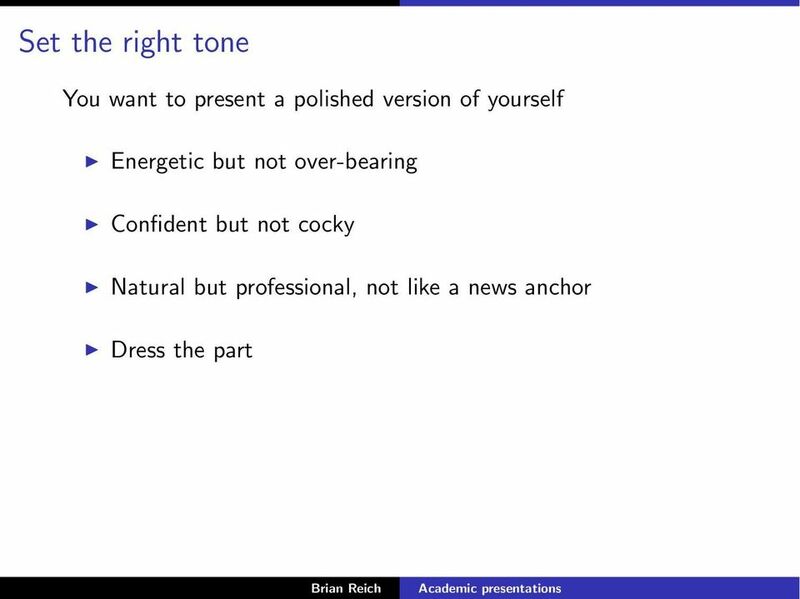 Think critically about the quality of presentations and try to incorporate the best (and avoid the worst) of the speakers traits. Name: Hour: Review: 1. Why are having good manners important when you re making a first impression? Career & College Readiness Lesson Plans Etiquette? What s That? Scientific Presentation Skills Melissa A. Hines, Dept. of Chemistry. Why is Public Speaking Important? Chapter 1: Introducing Public Speaking I. Identify what public speaking is and the person's social, academic, and career benefits to be gained from its mastery. Examine your beliefs about public speaking.